This year’s AES 143rd Convention in New York City will feature a variety of new events and presentations from top names in the industry, as the Audio Engineering Society returns to the Jacob Javits Center, October 18–21, 2017. Early registration pricing for brands looking to be a part of the convention’s exhibition floor or other sponsorship opportunities will be ending on April 28, and those companies planning to be a part of this year’s events should act now for best pricing and availability. From three days of gear exhibits, demos, and exhibit floor special-event expositions to four days of presentations and workshops featuring the biggest names in audio engineering, production, product design, and more, the AES NYC Convention will be the place to experience professional audio science and application at its finest. 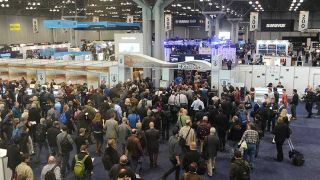 In addition, an expected 15,000 media production professionals for the co-located and independent NAB Show New York 2017 will have access to the AES New York exhibition and special events. Offering an all-encompassing and in-depth look into professional audio science and application, the AES New York Convention will offer several new exhibit floor offerings, including a Broadcast Audio Expo, Broadway Sound Expo, a Sotware.aes show area (in association with IMSTA), an Audio for VR Pavilion, and more. Also returning is the popular Project Studio Expo series (in association with Sound on Sound and sponsored by Genelec, Focusrite, Adam Audio, and Neumann), along with its counterpart, the Live Sound Expo—both open to all attendees of the convention. To exhibit or sponsor, visit aesshow.com or contact AES International sales manager Graham Kirk at graham.kirk@aes.org.